Born in a dank alley on the wrong side of the tracks, Freddie’s life has been an uphill battle since day one. He spent the first three months of his life in a shelter with a bunch of no good ruffians where he was exposed to an underground world that most of us couldn’t begin to fathom. When The Whole Ball of Wax first met Freddie at the shelter in 2010, he weighed under a pound, he had a six inch suture on the underside of his belly, and had just been exposed to a deadly disease that threatened his life. However, Freddie was created with a fighting spirit and a “blue collar” personality that allowed him to persevere and overcome the limiting odds placed on him at birth. Now a year old, Freddie is in the midst of his next life challenge. He is in the running to be voted the best cat with thumbs in the entire universe! Along with all the other challenges Freddie was dealt at birth, he was also born a polydactyl which provided him with an additional two thumbs on both of his front paws. Consequently, he looks like he is constantly wearing oven mitts. With only one week left in the voting, Freddie is in the fight of his life. He currently sits in 5th place and just 2 percentage points out of 1st. With time fading, every vote counts! This is a challenge to all readers of The Whole Ball of Wax to get on their computers, phones, and ipods to vote for Freddie as many times as possible. Tell a friend and tell them to tell two more. Send an email or a text to friends and family near and far and educate them on the greatness of Freddie and his extra thumbs. Tell them of his struggles and his perseverance and help make Freddie a true rags to riches story. 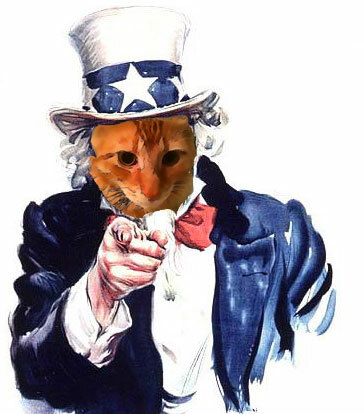 Freddie needs you and he WANTS YOUR VOTE!